I’ve been asked if I can take a look at Open Street Map (OSM), with the intention of creating a local map that would feature information of an historical nature, rather than current information. I’ve only ever created custom maps like this before using Yahoo Pipes (classification map of the world linked to a library catalogue search) and Google My Maps (a map that displayed works of fiction mentioning local areas). 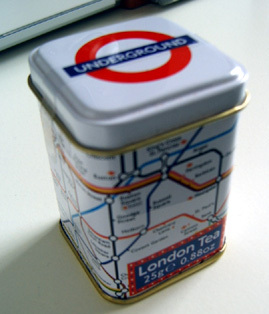 and have never used OSM. I’m not entirely sure how we’d achieve the same sort of thing (or better) using OSM without getting into some development that we don’t have the skills/money to achieve. After trawling through the wiki it seems as if we would have to set up a hosted site for a customised map; install appropriate map editing and rendering software to populate and display the map with the historical data; and export local current map data from OSM for the area we want to focus on into this customised map. If anyone can give me any advice I’d really appreciate it. The FoI request included details of issues, visits and PC bookings. After tracking down unemployment figures for electoral districts, I mapped them to postcodes so they related to the correct libraries. The data was then combined in a Google spreadsheet and the spreadsheet was mapped in Yahoo Pipes. Each library appears as a marker on the map and they contain information such as “Middleton Library. Change in issues: 20185 . Change in visits: 28409 . Change in PC Bookings: 945 / Unemployment 2010: 13.6%“. As I say, it was just a simple way of comparing usage figures of libraries situated close to each other alongside unemployment figures. It beats scanning a list of figures on a spreadsheet. I also just wondered if I could put Yahoo Pipes to practical use. My pipe tinkerings have previously been aimed at seeing what I could do with pipes, whereas this was more to do with putting it to good use and maybe building on it in some way. I visited the ‘Magnificent Maps’ exhibition at The British Library a couple of weeks ago. It contained so many colourful, imaginative and impressive hand drawn maps covering social, historical and political aspects of life. The creativity that went into these maps was fantastic. My particular favourites were a Chinese terrain map on silk (1700), an Eastern European map from 1896 showing scenes from daily life and The Tsarist octopus map (1877). The British Library also made great use of technology, by projecting a couple of the maps onto table tops and giving users what looked like a magnifying glass to explore the map in more detail. 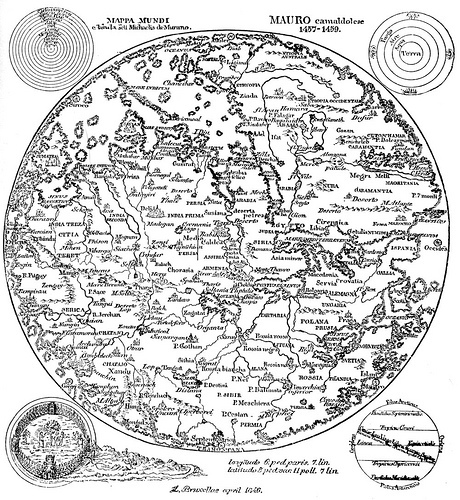 One of the maps was a reproduction of Fra Mauro’s Mappa Mundi from the 1450s. The magnifying glass didn’t have a lens, but when you placed it over certain parts of the map it expanded the image via the projector. It may have been RFID enabled, but I’m not certain. If you highlighted specific parts of the map it would also give you a pop up box of information and a voice-over would explain the significance. It was a really clever way of giving a bit more of a background to the map and what it meant. You can have a look at the map here and explore it in a similar way to the map at the exhibition. It was just really interesting to see all the creative things people have done with maps over the years and it’s given me a few ideas about what you can do with digital maps, rather than just putting markers on them and adding a bit of text. I seem to be getting into the swing of things with Yahoo Pipes at the moment and I seem to be creating lots of maps. Every time I use it, something else clicks in my head and puts a smile on my face. Yesterday, Aaron Tay asked me if I knew how to create a Twitter followers or friends map. I didn’t, but I thought it would be a good way to see if I could get to grips with some of Twitter’s APIs and also if they’d play more nicely with Yahoo pipes than previously. It was also nice to be asked by someone else to do something like this – my own projects seem to be a bit self-centred, so being able to do something useful for someone else made a nice change. The Twitter API lets you pull out details of a users friends/followers. It does this via their Twitter id number, but by creating a URL with their id added to it, you can pull out full details. You can use a programming language to do this too, but if it goes into Yahoo pipes I’d rather do it there. Once you’ve got this, you can narrow the info down to the various bits you need. In my case I wanted biography details, location, photo and a link to Twitter profile. 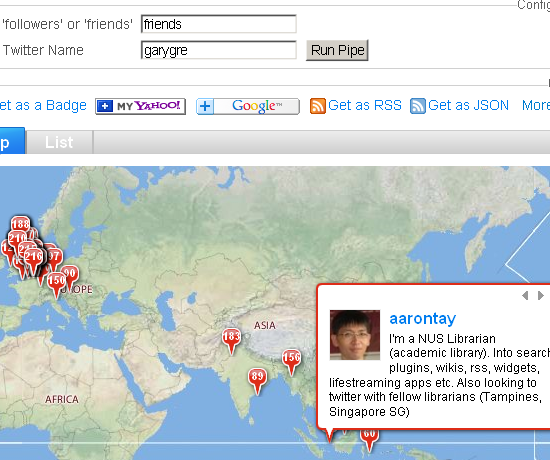 (1) Create user input boxes for ‘username’ and to identify if the map was for ‘followers’ or ‘friends’. This meant anyone can enter their user details, rather than just myself. (2) I then had to build a url to point to the Twitter API and include the detail in (1). (3) This url then fetched the details of the users followers or friends. ie their id numbers only. (4) I then built another url using the id’s, to fetch full details of every follower or friend of the user. (6) From various fields in each profile I then built a description that contained Twitter image, biography and location in text. (7) I also added a link to each of their Twitter home pages. 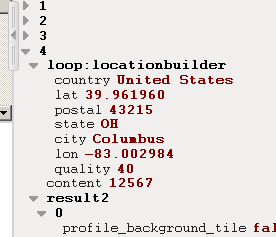 (8) Finally I mapped all of the data to standard RSS/map data fields (title, link, description, y:location). When Yahoo pipes works with data it changes field names to reflect what it’s done to the data, so you need to change them to a format that is recognised. (9) I connected it to the pipe output. One thing I would like to get to grips with in Yahoo pipes is to be able to embed the output of a pipe into a web page and also allow users to add their own input on the same page, but I’ve not cracked that yet. So, if anyone else can help me with that side of things it would be appreciated. Thanks. Before putting together the Surrey Fiction Book Map for work I was considering the possibility of creating a map of the world that would link from markers to Surrey Libraries’ catalogue. I didn’t fancy creating it manually and I was sure it could be done via Yahoo Pipes. However, at the time I hadn’t used Yahoo Pipes in this way before, so I didn’t follow through with the idea. 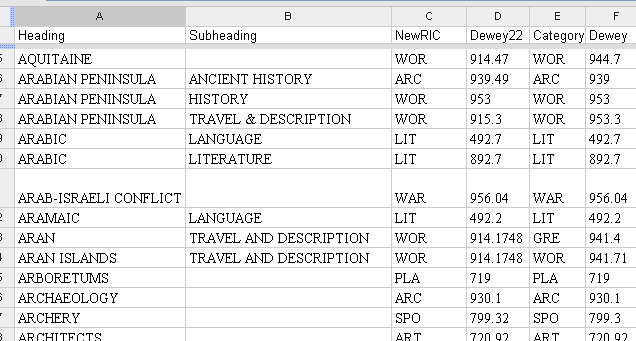 Now I’ve had a bit more time to think about it, I’ve managed to put something together using a spreadsheet version of our Subject index and Yahoo Pipes. Firstly, the spreadsheet contains all of the information I need – text description of the location, plus the sub topic (eg Travel; history; etc). It also contains the Dewey number and our Reader Interest Categories (RIC). In Surrey the RIC is used to shelve our stock by subject area – helping to bring together related stock that would otherwise be separated. I created a Yahoo pipe that pulled in the spreadsheet information. It then filtered the subject headings based on the ‘NewRIC’ column, removing any subject headings that weren’t location-based. In the above example you can see some subject headings in the original source file that it excluded eg Aramaic Language; Arboretums; Archery. I also fed the title field into the ‘Location builder’ module and it did a pretty good job of identifying the map locations mentioned. 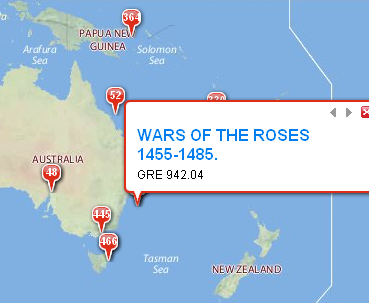 It did have some problems, as you can see from the fact that “War of the Roses” has been mapped to just off the Australian coast! This was due to the fact that some of the text wasn’t precise. I’m correcting these issues gradually, as there are over 800 items to check. Finally I created a link from each marker pin back to the library catalogue. As the subject index contained Dewey numbers I could add this information to each link via the String builder module. The link basically acts as a catalogue search. If you’re interested you can take a look at it here. As a next stage I need to tidy up the subject index, so it maps more accurately and removes subject headings that I can’t map correctly. 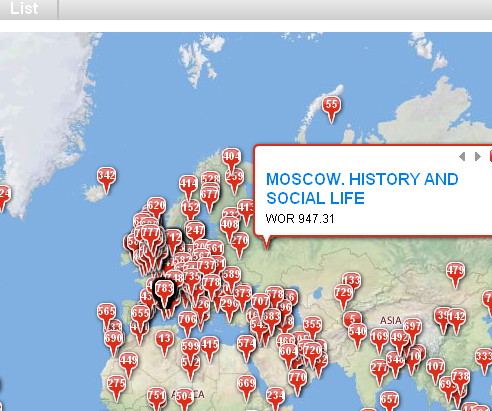 It would also be useful to be able to present the map so it is less tightly packed and maybe add a location search too. Maybe with some location images, as well. Also, if you do want to know what each part of the pipe does in detail, feel free to ask. At the end of June, Surrey is running a festival called ‘Celebrating Surrey‘, which highlights creative talent in Surrey. My team in the Library Service decided it would be a good idea to support this with something web based and creative. Part of the thinking behind this was to show colleagues in the Library Service how we could use resources on the web to help promote our stock in a different way. It also gave us an opportunity to experiment, by doing something we’d not tried before. 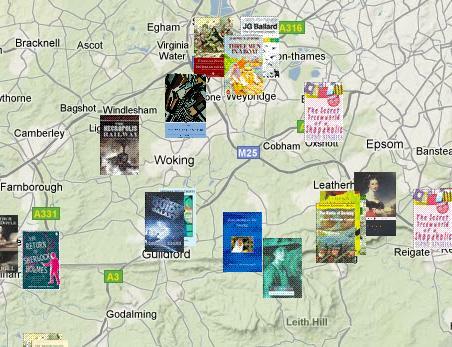 We decided to create the ‘Surrey Fiction Book Map‘ – this was a Google map highlighting works of fiction set in Surrey. The map itself uses book covers for the markers, which are pinpointed around the county. If you click on a marker it opens up to reveal more details of the book and gives the opportunity to borrow it from Surrey Libraries, or any other library that appears on Worldcat. 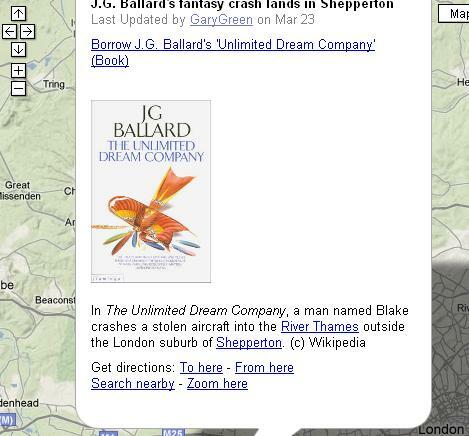 It was created manually using ‘Google My Maps‘ – pinpointing each book individually and adding book covers and links. With the power of hindsight, if I was starting from scratch, I’d put it together using a Google docs spreadsheet fed into Yahoo pipes. I recently set up another biographical map using this method and it was much easier. The only drawback of that method though would be that I couldn’t use the book covers as markers. I also added videos to some of the markers, but the links weren’t stable and kept disappearing. Future developments could include linking to biography pages for the author on somewhere like Wikipedia. The map is now finished and we now need to decide on where it will go. 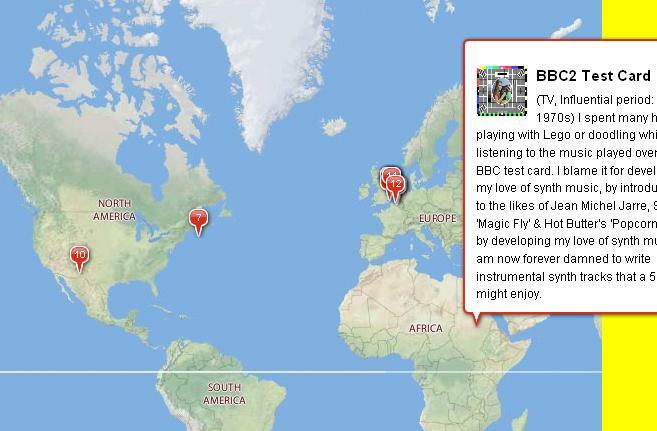 Options include linking from the website to the map, or adding to our anywhere.me page when it’s set up. It’s been an interesting project and I’m sure we can build on it. In a previous blog post I talked about a biographical project I wanted to attempt – I called it “This Made Me”. I wanted to put together a visual representation of things I consider influenced me throughout my life and made me the person I am today, just as an experiment to see what I could come up with. I’ve actually managed to turn that idea into something concrete using Yahoo Pipes to pull through information I added to a Google spreadsheet. Yahoo Pipes then automatically created the map with markers and details of influences in those markers. Here it is. The markers contain images pulled through from various websites and also link to relevant web sites too. The map only contains about 13 influences so far, but I’ll add others as I go along. I’m pleased with the fact that I’ve managed to create this without having to manually add the information to the map, as I have done with other maps I’ve created previously. It’s also helped me understand how aspects of Google docs and Yahoo pipes work and is definitely something I can build on. Both @psychemedia and @ostephens gave me plenty of tips on how to achieve this. So, big thanks to them. Putting this information on a map is only one way of doing things and I’d like it to be more visual (without a map), so I’ll see where I can go with it next. The data is there, it just needs to be fiddled with. Edit: Part of the challenge of doing this, is seeing if I could provide something that could be used by others too- if they wanted to. That’s why I didn’t create the map manually (for one reason anyway). Maybe a biography of a famous person could be created in the same way, detailing their life based around locations around the world. How about a great explorer like Christopher Columbus or James Cook? All you’d need to do is copy the Yahoo pipe and pull in the data from a different spreadsheet.